Gilder Lehrman Collection #: GLC07334.03.01 Author/Creator: Clous, John Walter (fl. 1868-1875) Place Written: Fort Davis, Texas Type: Document signed Date: 15 January 1875 Pagination: 2 p. ; 32.3 x 21 cm. Summary of Content: Signed by Clous as Captain of the 24th Infantry. 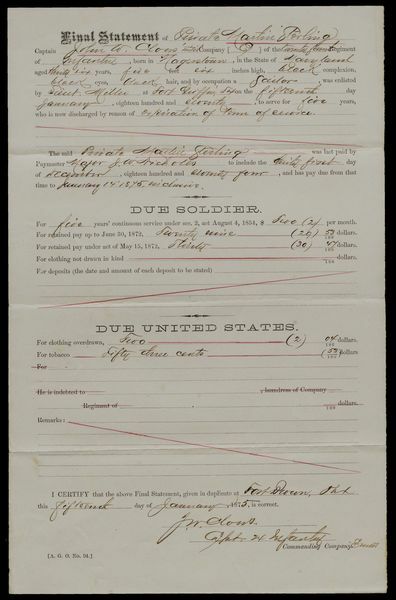 States that Sterling, an African American Private in Company E, 24th Infantry Regiment, enlisted at Fort Griffin, Texas 15 January 1870, and is now discharged by reason of an expired term of service. States that Sterling was last paid by Major J. W. Nicholls, United States Paymaster.